To fulfill the demand of High Power PoE for network applications with Fast Ethernet speed transmission, PLANET 802.3at PoE Fast Ethernet Switch – FSD-808HP is an ideal solution. 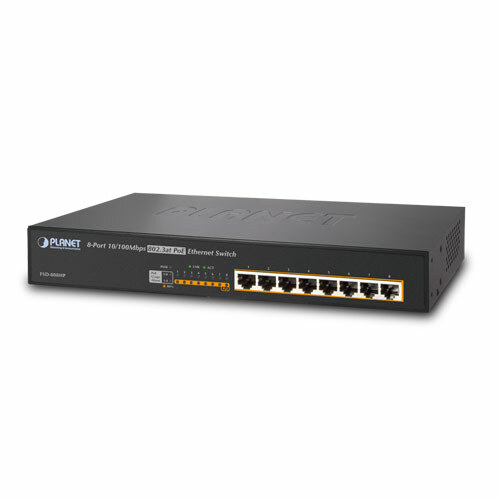 Each 10/100Mbps port of the FSD-808HP features IEEE 802.3af and High Power IEEE 802.3at Power over Ethernet (PoE) that combines up to 140-watts power output and data per port over one Cat.5E / 6 Ethernet cable. With totally 140-watt PoE budget on the whole system, the FSD-808HP is designed specifically to satisfy the growing demand of higher power consuming network PD (powered devices) such as PTZ (Pan, Tilt & Zoom) / Speed Dome network cameras, multi-channel (802.11a/b/g/n) wireless LAN access points and other network devices by providing double PoE power, more than the current conventional 802.3af PoE. The FSD-808HP helps users to monitor current status of PoE power usage easily and efficiently by its intelligent PoE Management feature of LED indication. There are two orange LEDs named “PoE Power Usage” located on left side of the FSD-808HP front panel. Of which, one LED indicates the total power output of Port 1-4 and the other LED shows the total power output of Port 5-8. When Port 1-4 or 5-8 PoE output is over 80%, the LED will be lit up. 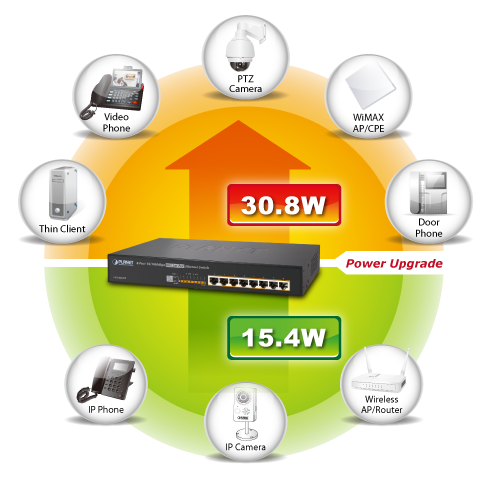 When Port 1-4 or 5-8 PoE output is over 95%, the LED will blink to notify customers for better PoE allocation. The Idle mode Link Down power saving of the FSD-808HP complies with IEEE 802.3az Energy-Efficient Ethernet (EEE) standard to automatically lower power for a given port when it is idled. Providing data transfer and High Power PoE function in one unit, the FSD-808HP is able to reduce the need of extension cables and dedicated electrical outlets on the wall, ceiling or any unreachable place. It helps to lower the installation costs and simplify the installation effort. All RJ-45 copper interfaces of the FSD-808HP support 10/100Mbps auto-negotiation for optimal speed detection through RJ-45 Category 6, 5 or 5e cables. It also supports standard auto-MDI/MDI-X that can detect the type of connection to any Ethernet device without requiring special straight or crossover cables.